Nothing like a little friendly competition between mayors. It seems a feud of sorts has developed between Chicago Mayor Rahm Emanuel and Seattle Mayor Mike McGinn over who can build the best bike lanes. At a speech in December marking the opening of the Dearborn Street protected bike lanes, Emanuel boasted that Chicago was going to lure Seattle’s tech workers — and companies — with state of the art bicycling infrastructure. Now I think it’s self-evident that I am a competitive, let alone an impatient person. So when my staff gave me this headline from Portland, it did bring a smile. The editorial from a magazine in Portland [the blog BikePortland.org] read, ‘Talk in Portland, Action in Chicago,’ as it reflected on Dearborn Street. The Seattle Bike Blog wrote, ‘Seattle can’t wait longer. We’re suddenly in a place where we’re envious of Chicago bike lanes.’ So I want them to be envious because I expect not only to take all of their bikers but I also want all the jobs that come with this. Now Seattle Mayor Mike McGinn is firing back, Seattle Bike Blog reports. McGinn addressed the challenge explicitly in his State of the City address earlier this week. 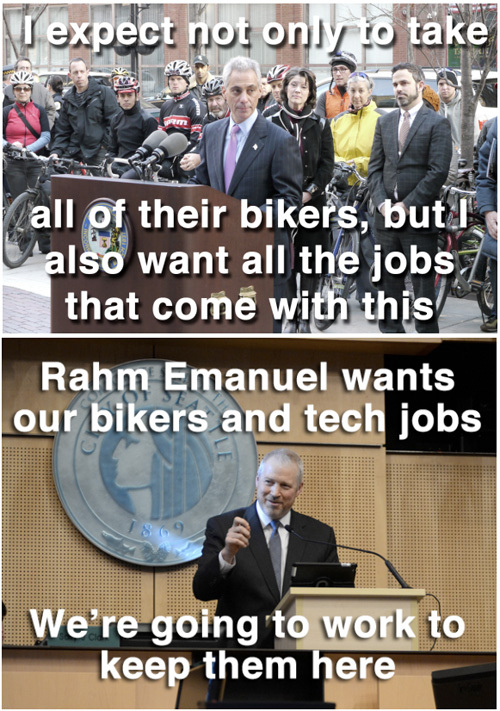 Mayor Rahm Emanuel, when he announced bike routes in downtown Chicago, called out Seattle, saying he wanted our bikers and our tech jobs. We’re going to work to keep them here. Sounds like good, healthy fun. If only more mayors were competitive about making streets safer for their residents. So San Francisco isn’t even a thought? Thanks Ed Lee. Fighting over bikers like we’re a non-renewable resource. How cute. Of course, the beauty of building proper bike facilities is that bikers spring up wherever you plant the facilities. We won’t talk about the embarrassing unreliability of the SF Bus system, the lack of triple racked buses, nor the fact that bikes are banned from the Muni surface rail system entirely. Rahm already has Boeing back there and due to the increasing congestion of Mayor McShwin’s crazy quilt of bike lanes now impeding flow thru traffic FOR THE MAJORITY OF OUT CITIZENS WHO DRIVE (carpooling or not), Rahm can have our bikers as well. We will keep the Tech jobs, thank you!